Let me start by saying that the safest way of connecting a portable generator set or any other power source to a house wiring is via a transfer system. The question of course is what to do if you don’t have one and a power outage caught you off guard? Fortunately, there are still some ways of energizing your house without a transfer switch, especially if you have a drier line. However, these methods may be not quite safe, would not comply with National Electrical Code (NEC®) and should not be used unless it is absolutely necessary in an emergency. I personally would not recommend doing this. However, I realize that some people will do so anyway, so I have compiled here some information to help you do it technically right. Of course, this information is provided for general reference only without liability of any kind- this is not a professional advice! Remember, you can always use extension cords to feed stand-alone appliances. If nevertheless you decided to power up your home without a transfer switch, let’s first review the safety issues before going over the available options listed below. Miswiring can create a hazardous condition. If you decided to go for it, be sure to observe the following basic rules and remember- you do it at your own risk. OK, now let’s get down to business. Most portable generators rated 5000 watt or higher have 4-prong 125/250V twist-lock outlet NEMA L14-30. It provides two “hot” wires, the neutral and ground as shown on the above diagram (the colors are for the mating cord; hot lead can also be red). Also see the configuration of other sockets. If you have an electric drier outlet, it can be employed as described below (which as I’ve said, may be dangerous if you are not careful). 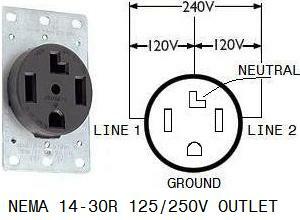 The homes built prior to 1996 may have a 3-hole 125/250V outlet NEMA 10-30R. It provides two “hot” wires and neutral (see diagram). The old appliances used with such an outlet had a jumper between neutral terminal and grounding lug. People are often looking to buy a 3-prong to 4-prong adapter. Well, there is no such thing: nobody sells it. In order to connect a generator output to the home wiring via an existing 3-hole drier outlet you’ll have to make one. Here is how. Take a standard 4-wire generator cord and remove its socket. This will expose four leads. Then there are two options. If you happen to have a loose mating 3-prong plug NEMA 10-30P, attach its X and Y terminals to two line wires and attach W to the neutral (refer to L14-30 pinout above). Alternatively, if you have a 3-prong drier cord, you can tie its loose ends to L1, L2 and N of the generator cord by using wire nuts. In both cases the remaining green lead can be used to ground the genset (read below). If your model has a built-in GFCI, then its frame is supposed to be already bonded internally to the neutral (you can verify this with an ohmmeter). Since neutral bus in your home is grounded inside the main panel, the frame of your genset will likewise be tied to earth via this connection. In this case you can just isolate the green lead and leave it unconnected. However, if your model does not have a GFCI, you may need to connect its frame to earth. There are several ways of doing this. A safer way is to install a copper or brass rod driven at least 2 feet deep into the earth and connect it to the frame via #6 AWG wire. See Article 250 of the NEC® 2017 for the requirements. Alternatively, if you are in a hurry, you can attach the green lead of the generator cord to the cover plate of the wall outlet. To tie it reliably, I would crimp a round lug to this wire and put this lug under any mounting screw of the plate. Note that if you rely on the cord for the grounding, obviously it will work only when this cord is plugged at both ends. Be sure to do it before turning the genset on. In all cases double-check continuity between the frame and earth by an ohmmeter. The maximum power you can provide to your house with such a scheme will be determined by the ratings of two 120/240V circuit breakers: the one that is in your generator and the one that is on the drier line, whichever is lesser. For example, if your genset has 30A breaker and your electrical panel has a 20 amp breaker for the drier, then maximum power you can draw will be 20Ax240V=4800 volt-amp. In reality, you may get even less because loads on L1 and l2 are often imbalanced (and by the way, it is recommended to load the breakers only up to 80%). To reduce risk, it is important to follow proper power-up and power-down sequences as described below. Begin turning on individual switches on the critical branches which you want to backup one at a time. A proper reverse procedure is equally important to reduce risk. Turn ON the main service breaker (assuming the utility power is restored). Newer homes may have 4-prong 125/250V drier outlet NEMA 14-30R. It provides a separate ground hole besides L1, L2 and N (see diagram). For our task it has the right number of leads, but a wrong geometry. To connect a genset to such a receptacle one can replace the socket in the generator cord by a 4-prong plug NEMA 14-30P. This is a pretty much straightforward task. Then you need to follow the proper power-up and power-down procedures outlined above. If you don’t have either the right NEMA plug 10-30P or drier cord handy, the things get more involved. If I had to do it, I would turn off the main circuit breaker, pull the drier receptacle off the wall, and disconnect all its wires. Then I would attach them to the generator cable one by one by using standard wire nuts with steel springs. I would of course double check that all circuits correctly match: “hot” wires are usually black and red, and the neutral is white. The remaining green ground lead can be bolted to the metal wall box. I would also secure somehow the cable, so it would not be hanging on its leads. If you don’t have a high-current receptacle, you can connect a portable source to your house at the main service box. First of all, of course, flip the main circuit breakers to OFF (OPEN) position. Then you can remove the cover door. Remember that the panel may still be energized from utility, so wear rubber gloves! Take a sufficiently long generator cord with 4-wire plug and bolt red and black leads after the main double-breaker to the “hot” bus-bars (the thick vertical metal plates). Be sure your connection is downstream from main disconnect and not upstream, i.e. not to the lines that go to your meter. Bond white and green leads to the neural bar and metal case respectively. Place a sign not to touch anything until genset is off. Turn off all individual breakers before starting up the genset to prevent its overload. Finally, turn on your unit and after it warmed up, activate those lines that you need, and do it one at a time. A final note. If your model is rated at 4000 watt or less, then most likely it provides only 120V. If your building has a standard 120/240V system, it means it has two separate “out of phase” 120V lines. In this case, unfortunately it’s impossible to power the whole house with a single 120V source. In theory, if you don’t have any 240V appliances (such as central a/c), you could supply electricity only to half of the electrical branches on one of the two 120V buses. If needed, you can additionally move some key branches to that backed up bus by swapping the respective circuit breakers. NOTE. The information in this site is provided AS IS for technical reference only without guarantee and liability of any type, neither explicit or implicit. It expresses only a personal opinion of the author, and does not constitute a professional or legal advice- see complete disclaimer linked below. If you use this information you do it AT YOUR OWN RISK. Always refer to NEC®, local codes and your product manual for wiring and safety requirements. It is strongly advised that all the work be done by a licensed professional (if you want to find one in your area or estimate the cost of the job- check out this site). This is by far the most helpful information I have found so far. Just a little confused though about the grounding. I have a 3 prong dryer receptacle which as I understand, has the neutral and ground bonded at the panel. I have confirmed continuity from the the neutral to the ground on the generator at the twist lock connection. So does this mean that I don’t need to do anything with the ground lead when connecting to the adapter? My current setup is genset>10/3 cable>L1430PCCV3 (no ground wire connected)>dryer cord>220 outlet. Is this the suggested method or do I need to either A. Run the ground wire to a metal pole in the ground or B. Somehow bind the neutral and ground wires from the 25ft 10/3 cable so they both tie into the neutral on the adapter? Based on your description, your genset probably has the neutral bonded to ground internally. If this is the case, you can just isolate unconnected green lead. To be on a safe side, I would kill the mains, connect the genset via extension cable and check continuity from its frame to earth (i.e. to any building’s electrical conduit). You need to be sure the frame is grounded, not just the twist-lock. This is all great advice, and information. A few years ago I back-fed 240V power from my 5000 Watt Colman through the ac circuit. With the main off and the ac fuses pulled. After less than a minute I herd some pops, and could smell something cooking. I quickly shut down the generator and disconnected it. In the house I found burned capacitors, switches, and transformers. Later, doing a voltage check I found that one side of the 240 generator receptacle was outputting 170V while the other 70V. Is a generator this much out of phase common? The most likely cause of this is bad connection in neutral wire. The genset still generates two out of phase 120V, which produces 240V in the twist-lock, but because of missing common point this voltage may be split unevenly between L1, L2. I am trying to hook my portable generator L14-30 to an air compressor NEMA 6-20 receptacle. I tried connecting the ground from the generator to the ground on the 6-20 but blew a few varistors as a result. The generator has a floating neutral. Should I connect the generator neutral to the 6-20 ground lead? Ground is just for safety. Connecting grounds together should not cause any problems unless something is miswired there. Varistors blow because of overvoltage- for example when 230V is applied to 115V circuit. 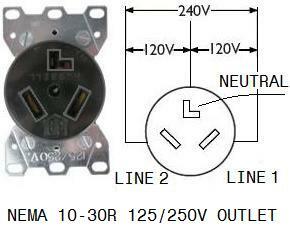 In general, for 240V output you would tie L1, L2 from L14-30 to floating L1, L2 of 6-20. The neutral from L14-30 whether it is floating or not is needed only for 120V. By the way, maybe one of two lines in your 6-20 is grounded in the panel, which is a problem because it would ground one “hot” line from the genset.